Relocating to a new country can be a challenge. It typically means working in a different environment, with new colleagues, settling into a new city and making it home, and needing to establish a new social life. The latest InterNations expatriate survey might make it easier to decide which destination will be best for an international job assignment. According to global market research agency Finaccord, there were roughly 66.2 million expatriates worldwide in 2017. This number has been growing at a compound annual rate of 5.8% since 2013. By 2021, Finaccord forecasts this figure will reach around 87.5 million. The 2018 edition of the Expat Insider survey, which has now been published for the fifth time, is one of the biggest and most comprehensive studies on life abroad. Overall, more than 18,000 expatriates from across the globe participated in the survey. These nonnatives represent 178 nationalities who are currently living in 187 countries or territories. From the survey responses InterNations created a ranking which lists the most and least desirable countries for life abroad, focusing on some critical features like quality of life, ease of settling in, working abroad, family life, personal finance, gender equality, career opportunities, digital life, and cost of living. Survey respondents rank Bahrain, Taiwan, and Ecuador as the three best destinations for expatriates in 2018. 🇧🇭 Bahrain defends its top position from the 2017 survey. The Gulf nation scores first place among both male and female respondents, generally doing well across most topics. An overwhelming number of people said Bahrain makes expats feel at home and the country is particularly popular with expat families. 🇹🇼 Taiwan, which moved up from fourth place in 2017, provides expats with a high quality of life, thanks to affordable healthcare and a good transportation infrastructure. Assignees in Taiwan are also very satisfied with job security and work-life balance. 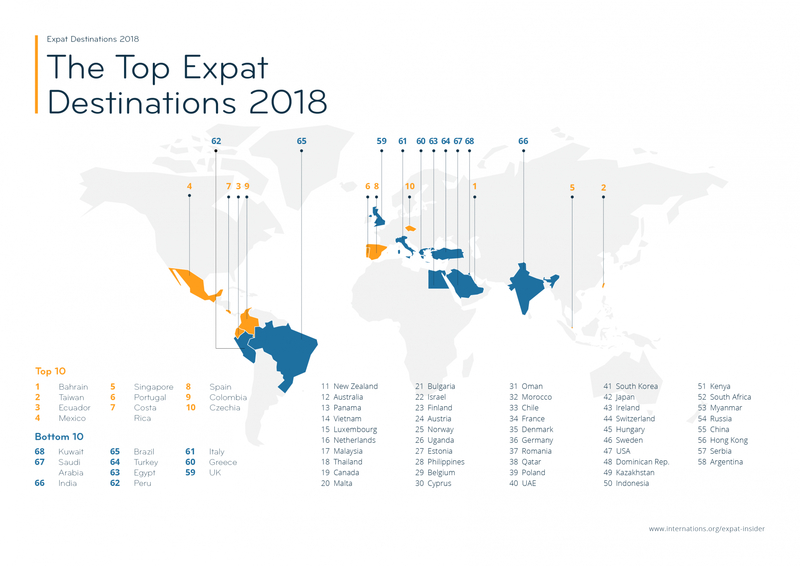 🇪🇨 Ecuador made the biggest leap among the top expat countries. After ranking 25th in last year’s Expat Insider survey the South American country now scores especially well in the financial security category. Respondents also give Ecuador a thumbs up for ease of settling in and work-life balance. Remarkably, none of the G7 countries made it into the Top 15 of the survey. The highest ranking of the seven most advanced economies is Canada at position 19. Within the G20 group of nations Mexico achieved the highest scores and ranks in 4th place. Which of these categories best describes you? Let us know in the comments below. You can download the complete report of the 2018 survey on the InterNations website.